8 Things I Learned From My First Solo Travel | Albatroz & Co. So 2016 has been the year of travel for me. I visited Poland earlier in the year with my school, I went back to my beautiful native land Ghana in July after finishing college and most recently I visited Belgium. Out of these travels my visit to Belgium was the first one in which I had not been with friends or family that either lived in that country or travelled with me. Until Belgium I had never even stayed in a hostel. I was looking forward to learning more about myself and was quite surprised at what I learned about myself and travel in general. The attraction to solo travel for me comes from is tge utter ease and hassle free of it. When I am travelling alone I have no one else's needs to care for but my own. I can be spontaneous in my plans or lack off. I can decide to spend the day in bed and have a short exploration of Brussels later instead of going to Leuven because I am so incredibly tired. And you know what? No one will care or get annoyed that I am screwing up the plan because there's no one to worry about. 2) Travelling Is Bloody Tiring. Following on from the previous point I'd like to point out the obvious here and say travelling is bloody tiring! I mean after landing in Brussels I went for an exploration of the area of my hostel and had dinner. The following day I dove into the city's capital with all the enthusiasm of a 19 year old looking to be amazed by another city surrounding. Following that day was my trip to Ghent which started early in the morning and ended with a night in Delirium surrounded by some new Canadian friends, flirty bartenders and the chillest spotify playlist. The next day was Brugge and following that was a day in bed with a massive and cheap doner kebab. After all the walking tours, walking to bus/train stations, walking looking or sights and squares and help etc. I. was. shattered and it had only been two days! So I am.not ashamed to say I spent a day in bed doing nothing and went for a short stroll in the city to watch street acts. You learn fast and hard the importance of money in a foreign country. I am not a money driven person for the sake of having it. I tend to work hard for the money I need and sometimes come across as a pretty happy go lucky all unicorn and happiness makes the world spin. But when you have to get up and go get your flight 7 hours early just so that you can use £5, the only remaining currency on you to buy food at the airport the realisation of the great power of money hits home hard. I mean I know money is important and I'd had to be really careful after the first few days being a little more generous than I could afford to be on tips and my bus journeys dwindling etc. But sooner or later the money starts to run out if you're not careful so be careful what you spend it on. 4) Research The Networks In Your Chosen Destination And Check Your Roaming Plan. This seems obvious and I thought I had it sorted but I was wrong. I had enough money to spend on network...in Ireland. It quickly depleted in Belgium and the network not being available there I had to buy a Sim card and thus threw more money away on that and credit on top of that. I know I could've gone online and bought more credit but it worked out cheaper just buying a new sim which did come in handy at the airport when I was able to watch 3 movies in my 7 hour wait. Free walking tours are the biggest lies of travel that I came across. The word free implies in gratitude yeah? However when someone takes two hours out of their day to walk a group around telling them about a city that is a job and not a hobby. And working people need to be paid and who pays them? The people they provide the service to which is well...you. A chunk of my money was spent on tips for guides both walking and boats. And after 4 cities, 5 walking tours and 2 boat tours it all adds up. So although the idea of a free walking tour is great when you want to learn more abut a city, prepare to spend a little for the service that is provided to you as in fairness it is only right. I love learning new things there's no doubt about it and although chances are I wont remember everything, I'll remember the feelings I had seeing and learning. With that said I don't think I'll like to go on another trip like the one in Belgium. Learning about cities is fun and all that but if I'm going to go away I'd like to DO something fun as well. I found I enjoyed the boat tours in Ghent and Brugge because I wasn't just walking around having things pointed out to me, I was in a boat instead. It's not much of a difference but not your conventional tour either. That's it. I'd rather have unconventional holidays, one or two lazy days lying by the sea is fun but what about one or two days Snorkelling and a day water skiing and lazing by the beach instead? I wasn't entirely surprised by learning this about myself but it's made me want to go even more on an adventure holiday. Bring on 2K17!!! As much as I loved travelling alone I didn't like the parts where I felt alone. When you're doing things and learning and meeting new people you don't have time to be alone let let alone feel alone. With that said there were exceptions like the time I walked into an Irish pub wanting some home comfort like even hearing an Irish accent and didn't even hear a single word of English. The loneliness set in most between activities when I was trying to decide what to do next. It'd have been nice to have someone to talk to and make plans with then. The worst times were those where I had no one in my hostel room for about three days so each day I returned to 5 other empty beds and lockers. But as one of the Costa Rican girls, a longtime traveller, that stayed one of the nights said, you just get used to it or find better ways to deal with it. I guess I'll just need a few more trips. I'll admit stepping off the plane at Dublin airport, no money, tired and having pined to return to Ireland I'd have gladly hopped on another plane somewhere. Perhaps after a shower and some sleep but I'd have gone without. I was so happy to be back and in my own bed. Happy to be in a country where I understood what people were saying and didn't need to rely of my knowledge of French or complete lack of knowledge of Dutch, Turkish or Flemish! Happy to be in a city who's transport and alleyways I knew. All in all Belgium will always be a country with at least four cities for now that hold good memories for me and I'd most definitely be returning to. You can check out my other posts of Brussels, Ghent, Brugge and Leuven if you haven't already. What was your first solo travel experience like? I'd love to hear what lessons you learned that we share or are different. I think everyone should do at least one solo trip! I've done a good few and although it can be lonely, I love the freedom too. Mostly because I love a lie-in and hate itineraries! I know right? 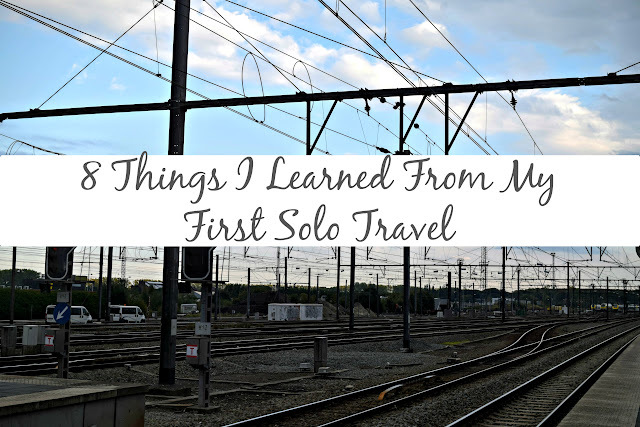 Solo trips I'm feeling are a bit of a of a character shaping experience and everyone if they get the chance should definitely go on one. Lie-Ins trump Itineraries any day!! So much yes to your first point! While I would love to travel with someone when I'm way out of my comfort zone, for trips like I've been taking I definitely love the freedom of traveling alone. You can make last-minute trip decisions and eat wherever and whenever you want, you can DO and look at whatever you want... So free! Speaking of free, free walking tours. More tour companies should have more information on their websites, haha. Going in to my first I knew a tip was expected, but I've seen others that didn't mention that expectation at all. It's a bit of a rude awakening, especially if you only have larger bills on you! I love your tips here! I would love to go to Poland, as my husband is Polish! I think I would get lonely too! Congrats to you for being g so brace! !